Discussion in 'Luthier's Corner' started by Gilmourisgod, Sep 12, 2014. This will be my third build overall, but the first entirely from scratch. It will be my first neck carve, and I am properly terrified. It should be obvious from the photo what I'm building here, but if we can all refrain from using the "R-Word", perhaps the Great Lidless Eye will pass over leaving us unharmed. This will be a fairly straightforward tribute build, a re-creation of a bass I stupidly sold in my youth, and have pined for ever since. I'll make a few subtle changes to make it identifiably a copy. For the record, this is purely for my own personal use, has already been promised to my son upon my demise, and will never to my knowledge be represented as anything but an amateur attempt at luthiery. To those on the fanatical "R" fringe who will be tempted to rant that a project such as this is tantamount to blashpemy, either post links to threads where you express similar reservations about tribute Fender, Les Paul, PRS, Musicman etc. builds, or please check your hypocrisy at the door. This will be a long, s..l..o..w build, as I have very little shop time, and many of the techniques required will have to be practiced on mockups first to avoid ruining expensive lumber. I'll try to keep the truly stupid questions to a minimum, but thanks in advance for any advice or constructive criticism you all may have to offer. As a tribute build, this probably won't interest the advanced builders, but you fellow noobs may get a kick learning from my inevitable mistakes. cazclocker, Fat Freddy, Fat Steve and 6 others like this. I am very much looking forward to seeing your build. Sub'd. Also, nice build. We don't get many Rick fanatics coming through here crapping on everything, so I expect you'll have no trouble. Doctor J, Roxbororob, blindrabbit and 2 others like this. neck. Hope to glue up neck laminations next weekend. Looking for opinions on a fingerboard material.. The current run of "R" basses uses a 3/8" slab of Chechen or Bubinga, which varies in color from orange to chocolate brown. I want to use a pre-slotted fretbaord, so I'm limited to what the handful of vendors who can do custom (33.25") scale stock for fingerboard material. I've been looking at LMI boards. They have some "cocobolo rosewood" (which is it, cocobolo or rosewood?) that look pretty nice. Suggestions for other sources for pre-slotted fingerboards appreciated. Cocobolo is a rosewood. All true rosewood species belong to the genus Dalbergia, and Cocobolo is Dalbergia retusa. LMII will slot a board of your choice. Basically, you send them the board and instructions (scale length, # of fret slots, etc. ), pay them $9 for slotting, and they ship it back. You pay for shipping both ways, so it's best to do several at a time to get your money's worth. Thanks Hammerhead, didn't know that. Maybe I can find a slab of Bubinga and send it to them for slotting. I'll be inlaying sharkfin position markers. Does anyone know if the cocobolo is more or less likely to chip out during inlay? I know ebony for instance is supposed to be pretty bad, this will be my first time inlaying. The way I see it, building it yourself gives the instrument much more sentimental value than buying it. Best of luck! Put some Visine in that eye! And also, I can't wait to see how this build goes for you. I use LMII pre-slotted boards for all of my builds. For $9, it's soooooo worth it to me. DOMIT and blindrabbit like this. That looks pretty cool, but LMI only stocks 5/16" fingerboards, so I'd have to order a 3/8" slab of bubinga from somewhere else, mail it to LMI, and have them slot it. For how it looks, do you think it's worth doing? It makes a difference in how I build this, because the fingerboard has to end up just shy of 1/2" above the top of body plane to work with the standard R bridge, so the thickness of fingerboard determines how thick the top of neck under the fingerboard is relative to the body. It looks like a fat 1/8" of blue painted maple here. I'll cut the whole neck beam to this thickness relative to the body, then route this part where it passes through the body. Opinions or suggestions on how important this detail is? I will NOT be carrying binding "nibs" up onto the fret ends like this. I always though that was a silly detail, since it usually gets nuked the first time you have to refret. CT, nice looking fingerboard. Where did you get the triangle fret markers? Thanks! I put a lot of labor into that, but it turned out pretty well. Those are pearloid (i.e., plastic) Les Paul Custom inlays, cut to shape. I intentionally wanted something a little different than the standard Ric sharkfin inlays. I know that the guys at LMII are pretty flexible. I would think that they could both source the 3/8" bubinga and slot it for you. Have you asked them about it? You should be able to find a Bubinga board at just about any respectable lumberyard that carries any exotic wood. Pick a nice board and have it planed down to 3/8" (some yards will do this for you for a fee) and you're all set. I would also recommend making friends with a millwork or cabinet shop operator. They have all the great big tools (big planers, jointers, drum sanders) and will often do small jobs like that pretty cheap. Always love some R builds! I was going to buy a 3/8" thick Bubinga fingerboard blank, ship it to LMI, and have them fret slot it, but the cost of this project is getting a little high, so I thought I'd just go with a stock 5/16" LMI fingerboard. That means I'll lose the strip of exposed fingerboard wood along the neck edge below the binding, but it allows for more thickness of rock maple neck vs. fingerboard, so I think it's a good trade. The R fingerboards have varied a lot over the years, but tend to reddish-brown or even orangey tones (see photo in previous post above). the LMI Padauk is too pink/orange. Based on the LMI images, I think I have it narrowed down to Bloodwood, Macacauba, machiche, and Panama Rosewood, all in the redddish-brown color spectrum. The cocobolo rosewood is gorgeous, but I've heard it's hard to glue. Any opinions or suggestions appreciated. Padauk finishes to a deep red. Bloodwood, if you put a finish on it, will be a dark brown. Without a finish, it's more likely to be a brick red color. I would go with bloodwood if it were me. @ HaMMerHeD +1 on the use of bloodwood. Though in my experience, I have found the opposite true of the color changes with padauk and bloodwood. I have found that padauk will darken and brown more over time whereas bloodwood seems to have a more stable color. It may depend on the way it's finished. 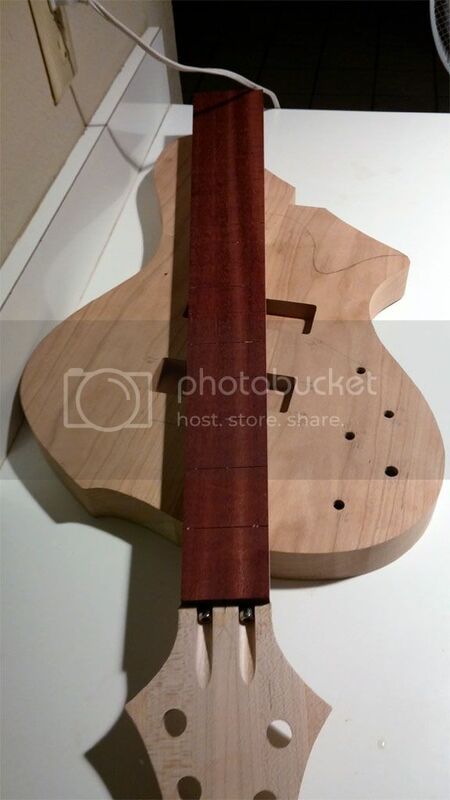 The attached bass picture features a bloodwood/wenge laminate neck. The bloodwood has retained a brilliant red color after a single coat of shellac and 5 coats of gel polyurethane. The table it is sitting on is padauk, was originally a bright orange when sanded, the brightness has turned more brown over time. FWIW: I think both woods are a pleasure to work with. Padauk is a bit softer and will dent easier. The final shade of the bloodwood made depend on the original color - I've seen many different shades - and the bright red stuff is harder to find. Because the body wings meet the neck at two different points along a a symetrical neck taper, there is a very slight (.008" !) weirdness wherein the fingerboard keeps tapering outward as it overlaps onto the body. This is only an issue if the neck beam changes from tapered to straight at the point where the wings meet the body (like I have drawn out now). If the neck beam keeps tapering outward, no problems at this joint, but it's obviously a bit harder to fabricate. My inclination is to say F the continuous taper, but this could come back to bite me in the arse if i'm overlooking something here. Anybody out there build one of these recently? Mapleglo used a Carvin neck on the Leafenbacker, I think they go from taper to straight beam at the end of the fingerboard. What's the consensus, should I bag the taper, or is it crucial somehow? The Carvin neck tapers through its length. I used dowels when I glued on the body wings so the wings wouldn't slide when I clamped it all together.